The opening of The Clove Club earlier this year was one of the most eagerly awaited restaurant launches of 2013. It’s the combined effort of former Ledbury chef Issac McHale, and the pop-up maestro duo of Daniel Willis and Johnny Smith who ran the hugely successful Upstairs at Ten Bells. The menu is ambitiously refreshing, and focuses on the use of fresh, seasonal British ingredients. Home for The Clove Club is The Shoreditch Town Hall which has been turned into a bar area at the front, and a dining room at the back with an open plan kitchen. The space is light, airy and decorated with a minimalistic approach. It’s rather sparse in fact, and the lack of soft furnishings in the dining room meant dinner was a rather noisy affair. Nevertheless, the food was excellent. Dinner was a set tasting menu that consisted of three little appetizers followed by three savoury courses and two desserts for a very reasonably priced £47. The first of our three appetizers was some perky and slightly crunchy English asparagus that was served with a fantastic gochuchang mayonnaise. Gochuchang is a Korean condiment made from red chili, glutinous rice, fermented soybeans and salt. Here it had been used to create a mayonnaise that gave the asparagus a little kick. 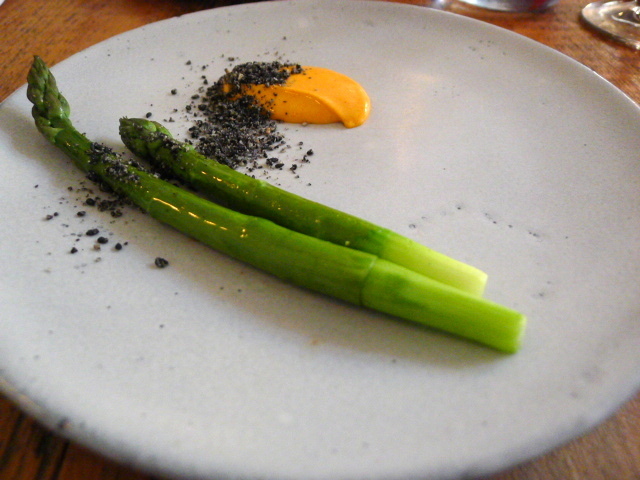 A sprinkling of finely ground black sesame was warm and aromatic and worked with the asparagus nicely. McHale is well known for his buttermilk marinated chicken and it’s easy to see why. It was deliciously moist with a crispy and texturally interesting polenta batter coating. 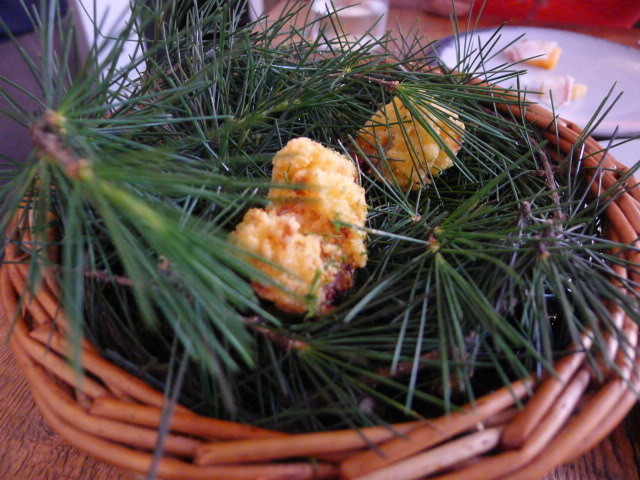 For a touch of fresh woodiness, pine salt had been used to complete the chicken. 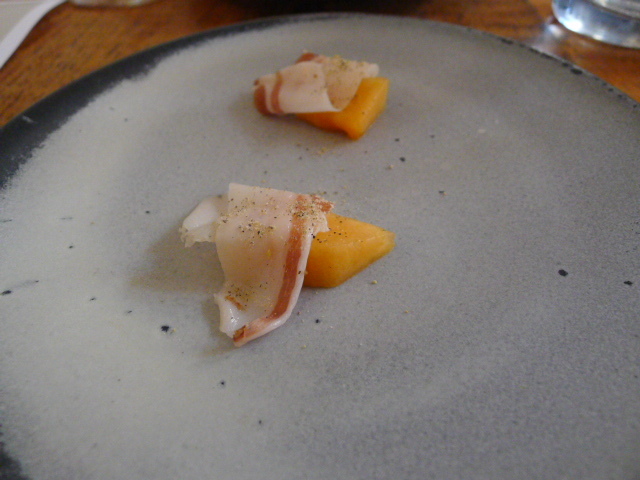 Matua melon from Italy was sweet and served with homemade lardo and Szechuan pepper for a bit of spice. Scottish black pudding was our first savoury dish and this was delectably moist and rich with flavour. It came with some ripened peach that helped to cut the strength of the pudding, and some finely chopped green beans that added a depth of texture to the dish. Wild Irish char was fresh and nicely cooked. 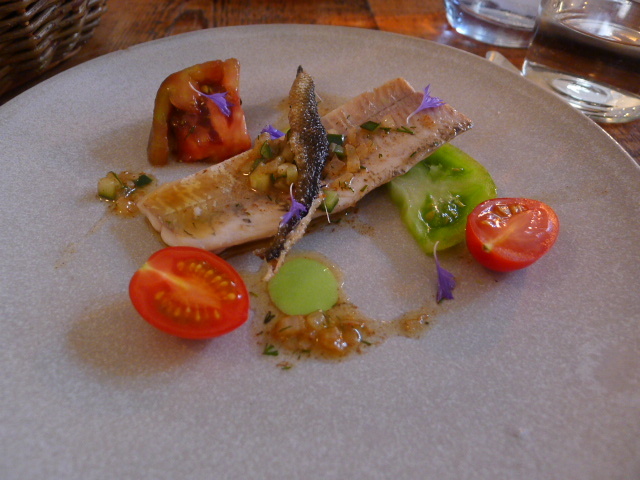 Accompanying the fish were some sweet, ripened green tomatoes, a fantastic nutty brown butter and zingy aromatic dill. Irish char would not have been my first choice as it’s not the most flavoursome of fish. Furthermore, we were really looking forward to trying the salmon listed on the menu. But as it turned out there was no more salmon for the evening. So to make up for the confusion the restaurant accommodatingly sent out an additional dish of Anjou shallots with a Montgomery cheddar sauce and truffle shavings. What a nice touch! Having been baked in its skin, the shallots held in their moisture and were very flavoursome. The sauce was gloriously creamy and light and it really helped to complete this dish. 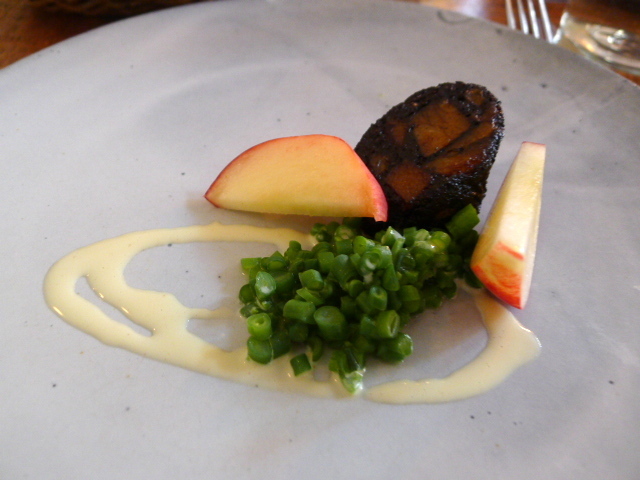 McHale has staged at Noma, so it was unsurprising that such great flair had been injected into this vegetarian course. 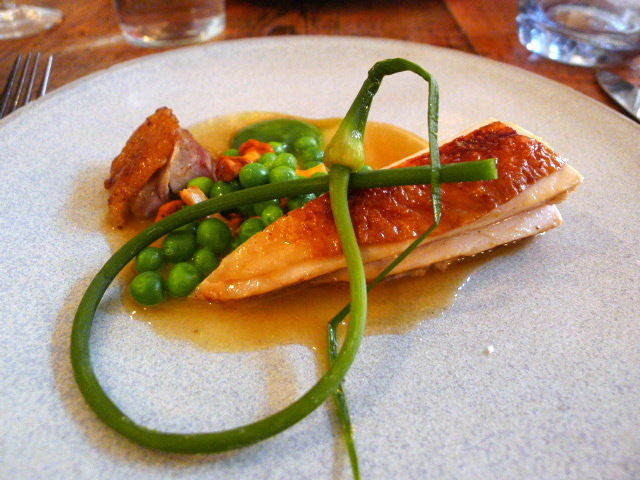 Slow roasted 100-day Lincolnshire chicken was tasty and served with the sweetest of green peas, girolles, in-season garlic scape and a tarragon puree for a herby finish. In some ways this was a very simple dish, but the lovely flavour of the chicken and the sweetness of the vegetable accompaniments really came through. 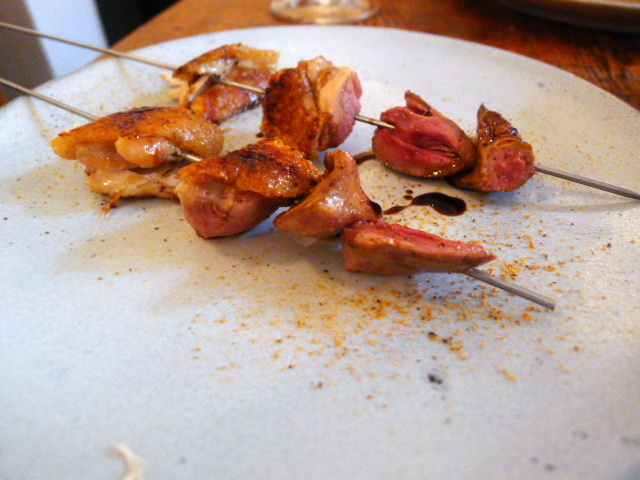 Accompanying the chicken was a skewer of well-cooked and well-seasoned chicken liver, kidney and heart. 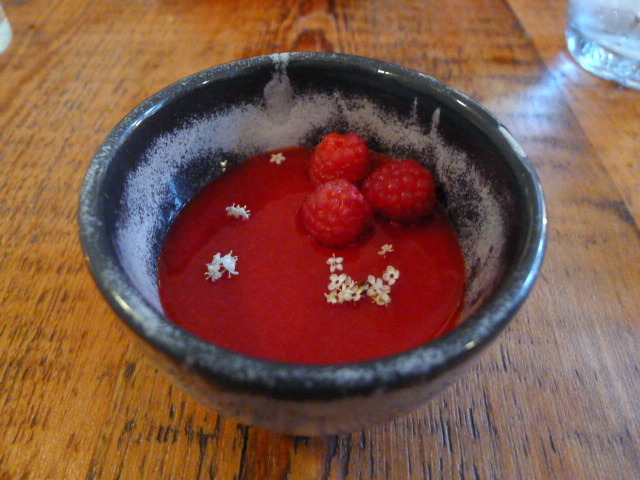 We loved our first dessert of baked elderflower custard and raspberries as it was divine. The custard was incredibly light and showed great finesse, and the acidity and sweetness of the raspberries really electrified this dessert. 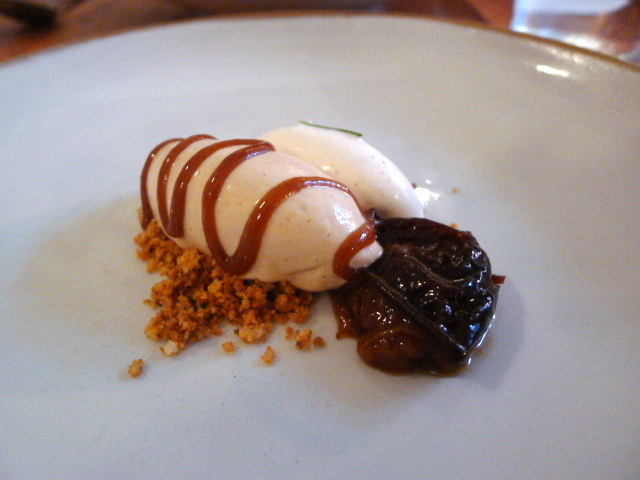 But the second dessert of prune ice cream with rosemary sorbet and walnut cake crumbs was less appealing. The ice cream was well made and smooth, but the flavour of the prunes as an ice cream was hard to warm to. 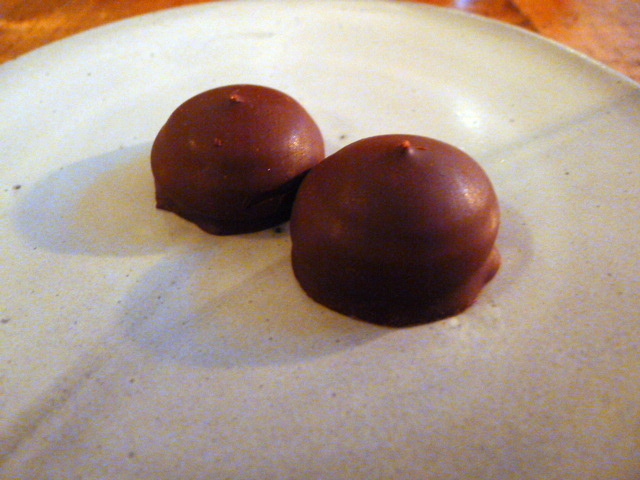 This was a dessert that was almost trying too hard to be clever. For the final flourish, we were presented with some lovely tea cakes made with the crispiest of biscuits and a light and fluffy marshmallow centre. 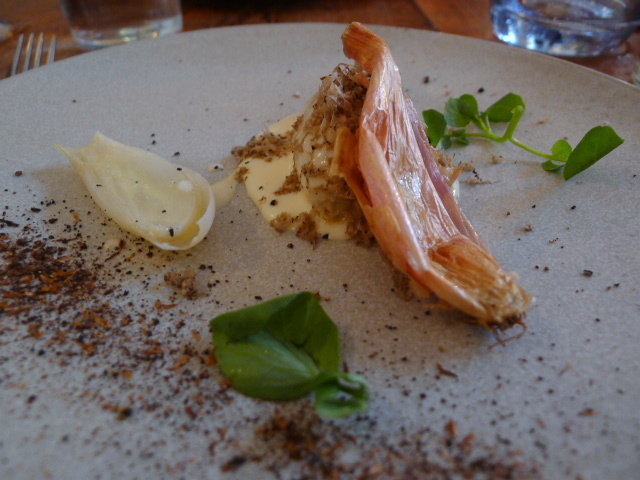 Our meal at The Clove Club was a faultless experience. Other than the prune ice cream, there wasn’t one thing we didn’t enjoy on the menu. The ingredients sang with freshness, quality and seasonality; the cooking was astoundingly good; and the composition of the ingredients showed provenance and inspired thought – all at a very reasonable £47. The service was considered and accommodating – the extra dish thrown in to smooth over the lack of salmon demonstrated as much. The biggest letdown was the noise, but I’d eat at The Clove Club any day. Prices: Menu is £47 excluding drinks and service.